Arthur Moses sends over this gem of photo that I've never seen before. This shows Houdini arriving in Los Angeles on April 20, 1919 to begin work on The Grim Game. This comes from the Exhibitors Trade Review, May 17, 1919, which also contains the following report. 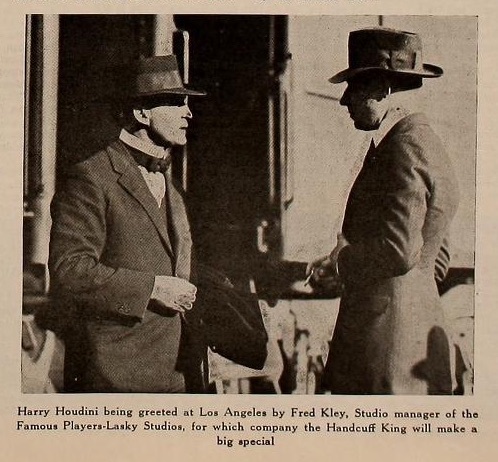 Harry Houdini, monarch of mystery, has arrived in Hollywood, CAL., where he started work immediately at the Lasky studio under the direction of Irvin Willat in the big six-reel mystery picture written specially for him by Arthur B. Reeve, author of the "Craig Kennedy" stories, and John Grey. 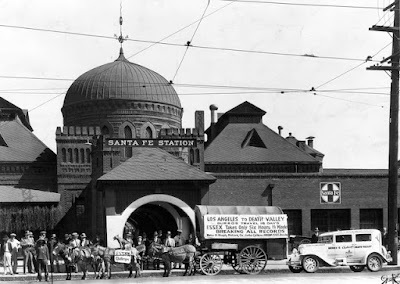 Houdini was met at the Santa Fe station in Los Angeles by Studio Manager Fred Kley and others, including a number of newspaper and publicity men who had been lying in wait for him with a number of stunts of extrication which they figured he would be unable to perform. They wasted no time in setting the famous escape artist to work, but he managed to wriggle out of every single one of the schemes they had prepared for him. What I especially like is this tells us the train station where Houdini arrived. The Santa Fe station (or La Grande Station) was located on 2nd Avenue and Santa Fe and was the main passenger terminal in Los Angeles before Union Station opened in 1939. It was demolished in 1946. Another forgotten photo surfaces! Thank you John and Arthur. Fred Kley is holding a cigarette in his right hand. They wasted no time in setting the famous escape artist to work and in a few minutes they had chained and roped him to one of the big wheels of a locomotive. When they believed he was secure they told him he might release himself if he could. He did so in less than a minute. Tempting to think he might have taken those famous photos on the train wheel, etc., on this day, but I feel like those were done at another time. is the picture and article as they appeared in the magazines. Thanks Bill. That is indeed what Arthur sent me. I chopped it up for presentation.